There's a famous episode of I Love Lucy where the always star-struck Lucy Ricardo visits Hollywood and wants to see some real movie stars. She decides to dine at the Brown Derby, a Hollywood restaurant famous in the 1950's for its movie studio clientele. 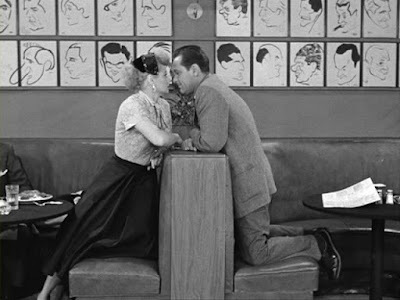 She didn't wait long; soon, the maître d' seats 50's icon William Holden in the booth behind her. Of course, Lucy must turn around and stare at Holden, which understandably annoys the star who simply wants to eat his lunch in peace. After a few uncomfortable moments, Holden decides to flip the tables on Lucy. He begins to stare and sigh at her! This completely unnerves her, who ultimately can't take it. She rushes out of the restaurant, accidentally dumping a plate of spaghetti on the star in her hurry to get away. I bring up the episode because it plays into a common objection I hear from atheists: "Imagine what an egomaniac God must be if He commanded everyone to worship him!" In fact, a friend wrote me last week and said he was in a conversation where someone asked "Why does God demand to be worshipped?" Is the worship of God similar to Lucy's fawning over Holden? Do only egomaniacs seek out such devotion while well-adjusted individuals would be bothered as Lucy was? 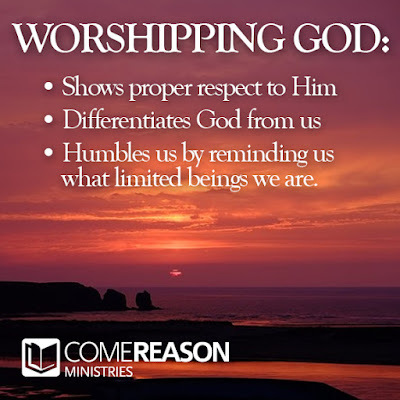 In looking at the claim that any god who seeks out worship is egotistical, one should immediately notice that it errs in making a specific assumption. It assumes that God is something on par with you and me. When humans accept worship from other humans, I can see how that is ugly and uncomfortable. That's because all men are equally subject to both the forces of nature as well as their own fallibilities. While the ancient Romans declared Caesar to be divine, he could neither stop Vesuvius from erupting nor stem his own death. It makes no sense to worship a man who has no power that any other man could not also assume in the right circumstances. God, however, doesn't fit into this category. In fact, it is a function of worship to draw attention to the differences between God and us. Through worship we recognize that God created the universe and its rules are subject to Him. It is through worship that we acknowledge God as the author of life, we are his creation and as such we are subject to him. We also recognize God's goodness and holiness. Worship helps us to remember that we are not God. That's something Caesar forgot. A general and a private are both human beings. We would expect any doctor in the emergency room to try and save both lives with equal effort. Yet a general would demand a salute from a private. Is this arrogance? A father would demand obedience and respect from his son. Would that be considered arrogant on the part of the father? In both cases, the show of deference and respect by the younger person is considered right and appropriate. 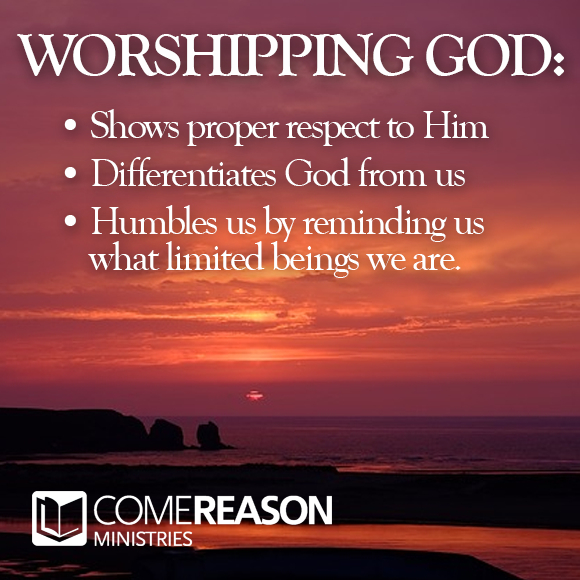 Worship shows the proper deference to God. The Father is He who gives us every good and perfect gift and in him we exist moment by moment. Thus it is good and right to show deference to God for his provision and sustenance. How other than worship could such deference be recognized? Lastly, worship is necessary for humanity. In raising the charge of egotism, the atheist is actually demonstrating why proper worship is necessary for human beings. Worship is necessary to humble ourselves. By objecting to even the concept of worship, atheists demonstrate subjecting oneself to another is not a task to take lightly. It raises all the flags to uncover our desire to be subjected to no one and nothing. But certainly the atheist, like Caesar, has no control over either his own mortality or the forces of nature. Sure, scientific advancements allow us to cool our homes but they can't stop a volcano. They may prolong life a couple of years, but they cannot grant immortality. Worship humbles us and reminds us to not become egotists ourselves. Worship shows proper respect to God, it differentiates God from us, and it humbles us by reminding us just how limited we are. It isn't God who is egotistical because he commands us to worship; it is our egotism that worship of God guards against.